Use a food processor to make quick work of chopping all those veggies. If you don't have one, you can mince them instead. You want the veggies to be finely minced--this will ensure moist but not soggy meatballs. If cooking longer than five hours, increase the water in the recipe to 3/4 cup. 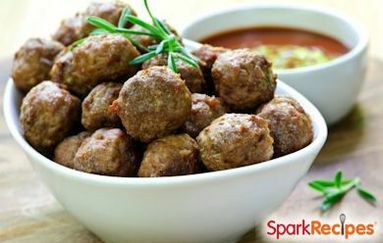 Lean but packed with flavor, these meatballs are a comfort food favorite. Pulse the onion in a food processor until finely chopped. Coat a large saucepan with cooking spray and place over medium-high heat. Add the onion and cook for about four minutes, until it starts to soften. Meanwhile, add the remaining vegetables to the food processor (no need to clean it after chopping the onions) and pulse until they are finely chopped. Add the veggies to the pan, stir and cook for another four minutes, until their juices start to evaporate. Add the herbs and spices, stir, and remove from heat. Transfer the pureed veggies from the food processor to a medium bowl. Refrigerate for five minutes to cool slightly. Add the beef, bread crumbs, egg yolk, and one tablespoon of Parmesan cheese to the bowl with the pureed vegetables. Using a fork or slotted spoon, thoroughly mix. Scooping two tablespoons at a time into your hands, roll the meatballs between the palms of your hands. Place them on a baking sheet and bake for 20 minutes until cooked through.